Whether it’s Sydney, São Paulo, or San Francisco, Uber provides a reliable way to get to and from the airport for work. Here are 5 tips to make the ride even smoother. One of the advantages of using Uber for your business travel is our global coverage–meaning regardless of where you need to travel globally, it’s more than likely Uber will be there. This extends to airports too–in fact, you can get an airport ride with Uber at over 300 airports worldwide, including coverage at almost all major US airports. If you’re a frequent flyer, or even if this is your first time using Uber to get you to your next flight, hopefully these tips will make your journey a little easier! There’s nothing worse than rushing around in the dark before an early work flight, making sure you’ve packed and organized everything you need for the trip. Scheduling a ride with Uber in advance means one less thing you need to worry about before your flight–a car will be waiting outside when you’re ready, at the time you requested. In fact, you can schedule a ride up to 30 days in advance for the most important events in your calendar. How-to: To schedule a ride in advance, just tap the car icon next to the ‘Where to?’ bar, set and confirm your pickup details, and then the app will remind you when it’s time to ride. Many airports allow you to specify the door number or bay your driver can pick you up at. For that reason, we recommend you wait until you’re at the door with your bags before requesting. Plus, your driver will thank you for not having to wait! Saved places isn’t just for airports, but it’s particularly useful for business travelers who are often in a time crunch. With this feature, you can save the most common places you need to travel to, meaning just three quick taps when requesting your ride. How-to: To set a Saved Place, tap ‘Where to?’ in the Uber app, select Saved Places and Friends, and then Add Saved Place. If you’re often using Uber for work travel, one of the fastest ways to make expensing your ride easier is by adding a Business Profile. With a Business Profile, you can specify a different payment method and email address where receipts should be sent. If your company uses one of our supported expense providers, you can also choose to have your receipts forwarded automatically for inclusion in your next expense report. See the frequently asked questions below for more! If you’ve already requested a ride, or are mid-trip, you can easily change your payment card, or switch from Personal to Business, or vice versa. How-to: Just tap the payment method or profile in the Uber app, and change to the appropriate one for that ride. And if your trip has already finished, you can use in-app support to request a change (see the frequently asked questions below for more information). From which airports can I request a ride with Uber? You can request a ride with Uber from over 300 airports worldwide. To check if Uber is available where you’re flying to, check this page. Where do I go to meet my driver when I land? When you open the Uber app at a supported airport, you’ll be prompted with instructions on where to meet your driver, and in some cases, exactly where you’ll meet in that zone. How do I set up a business profile? 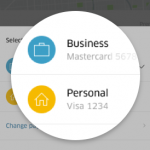 You can set up a Business Profile in the Uber app by navigating to the ‘Settings’ menu and selecting ‘Add Business Profile’, or from your computer here. How do I change the credit card I used after a ride has finished? You can request a change to the payment type your ride was charged using in-app support. Select ‘I had a different issue’, then ‘I used the wrong payment method or profile’, and follow the prompts.